One of my workmates got married on the weekend. He was still at work late Friday afternoon, being his helpful self, sorting out problems that other people had caused while ordering flowers and nipping out to purchase cufflinks. One of the people he was helping was me, as I had made a bit of a mess of a piece of routine work. 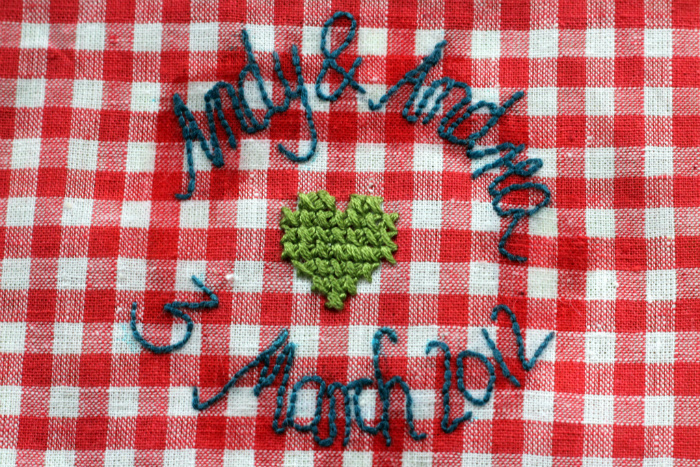 So I made him and his wife this little wall hanging as a thank you for being awesome and to celebrate their wedding date. First, I wrapped the outer piece of the embroidery hoop with washi tape. As I was going to be using the hoop as a frame for the finished work, this made it look pretty and also holds the fabric in place. I trimmed the piece of fabric to size with pinking shears and placed it in the hoop. 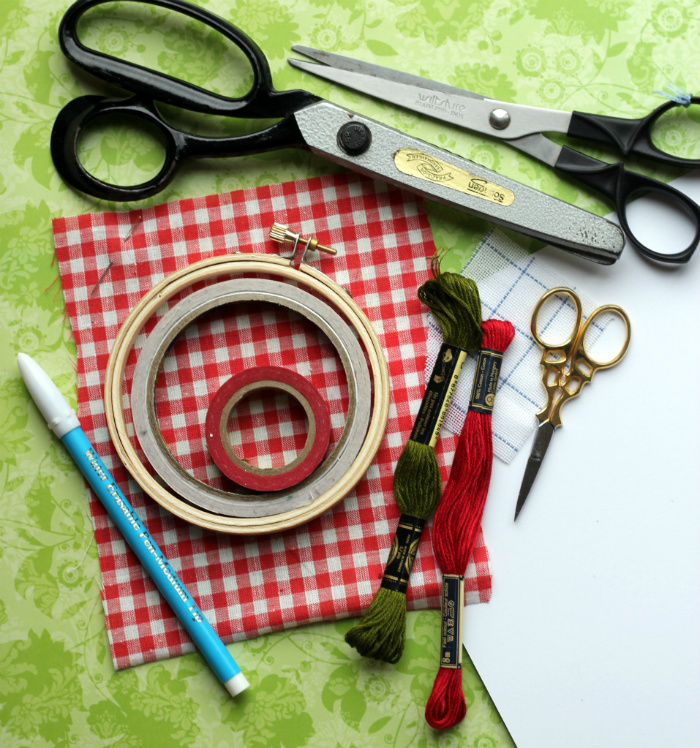 You can use regular fabric scissors, but pinking the edges will keep them from fraying. I then used the water soluble marker to draw a circle, which helped me place the names of the couple and the date. I wrote the names and the wedding date along the lines of the circle. I practised on a piece of paper first, until I liked the way the lettering looked. 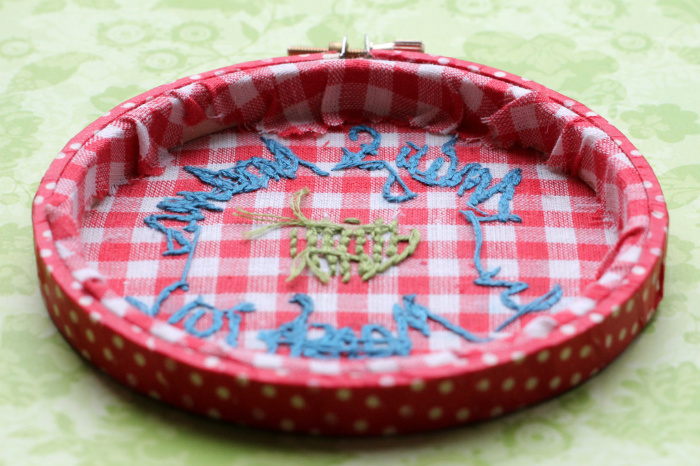 I then embroidered along the lines of the letters and numbers in back stitch, making sure the stitches were roughly the same length. 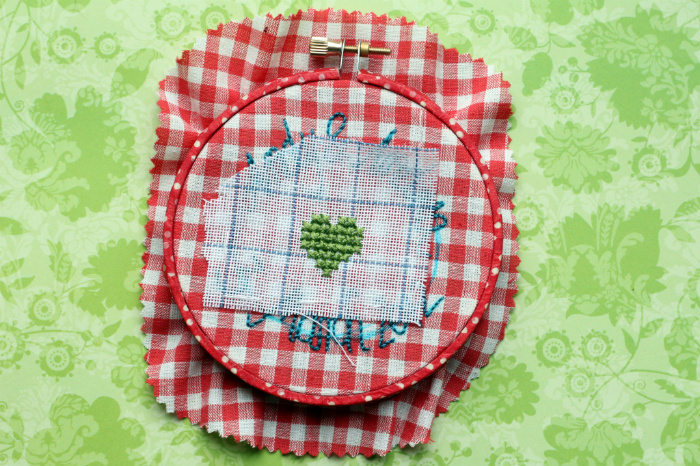 After I was done, I basted my piece of waste canvas onto the middle and cross stitched a simple heart design over three threads of the waste canvas, making the crosses slightly larger than usual. In order to determine where to place the heart, I held the frame against the light to see where the middle of the design was. 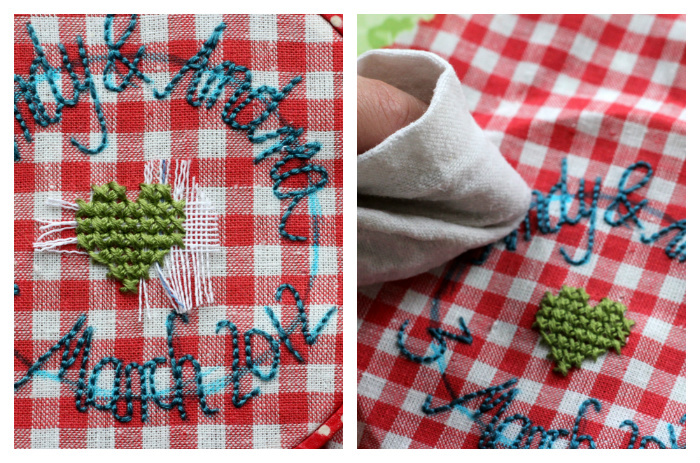 Once done stitching the heart, I carefully trimmed the waste canvas around the design and removed the threads one by one. You can use tweezers for this if it appears too fiddly. I then took the finished embroidery out of the hoop and used a clean, lint free cloth that I dampened with cold water to remove the marker for the fabric. It is enough to dab the lines, but you could also rinse out the whole piece. 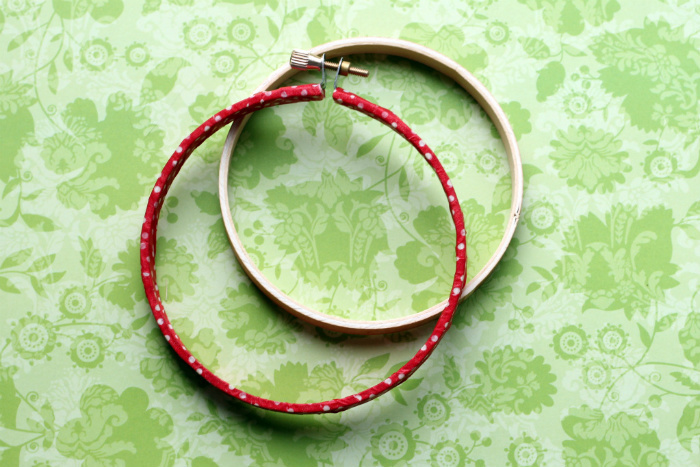 I let the fabric dry and then placed it back in the hoop. I trimmed it all around to a length that gave me an overhang of about 1cm, using the pinking shears. I attached a length of double sided tape all along the inside rim of the hoop, removed the backing and folded the edge of the fabric over to the inside to secure. This is what the hoop looked like from the back after I was finished. I then used a pencil and traced very lightly around the outside of the hoop on a piece of cardboard. This was going to be the backing for my wall hanging. I cut the circle out just inside the lines and used a glue stick to secure the cardboard to the back of the hoop. 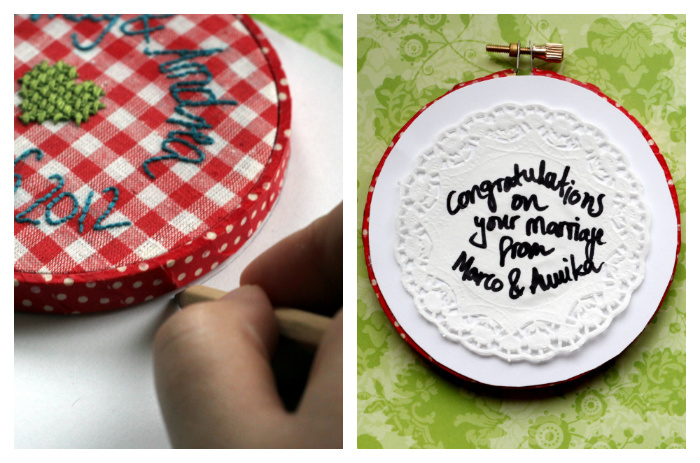 I also glued on a paper doily with a message for the couple, but whether or not you would like to do the same is up to you. I attached a pretty ribbon to the screw and then I was done! I hope this tutorial was okay to understand. 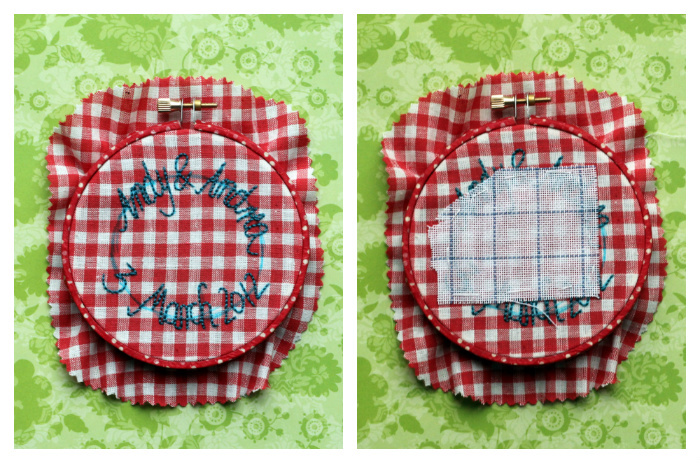 Let me know if you make your own little gift for somebody! 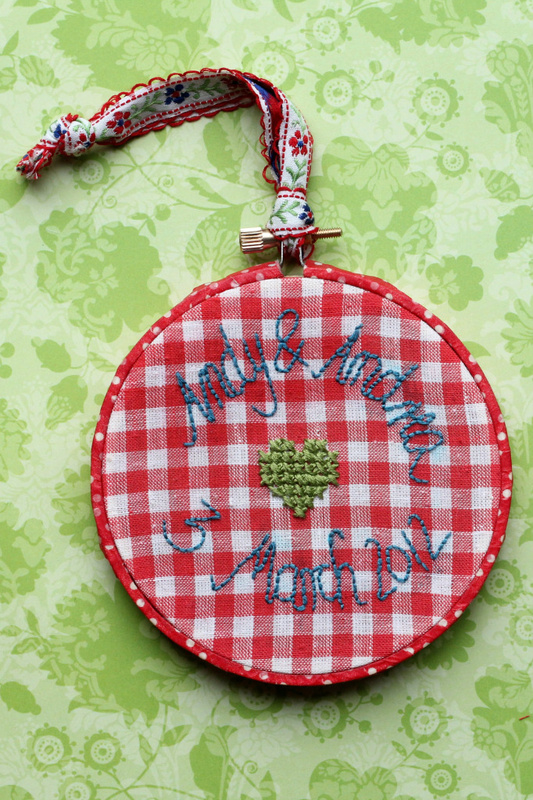 It doesn't have to be for a wedding, you could also give it to somebody to commemorate the birth if a child or embroider the names of you and a friend? I am sure you could come up with all different kinds of ideas! 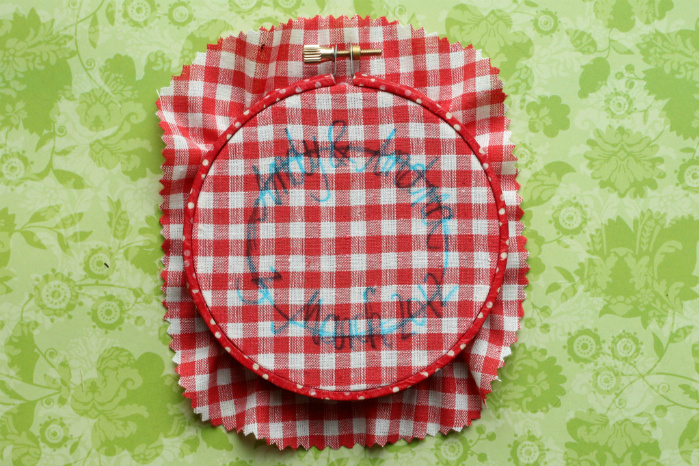 Thank YOU for sharing!It´s the fist time i work with the hoop and i discover your blog and your tutorial, isn´t that great? so cute! 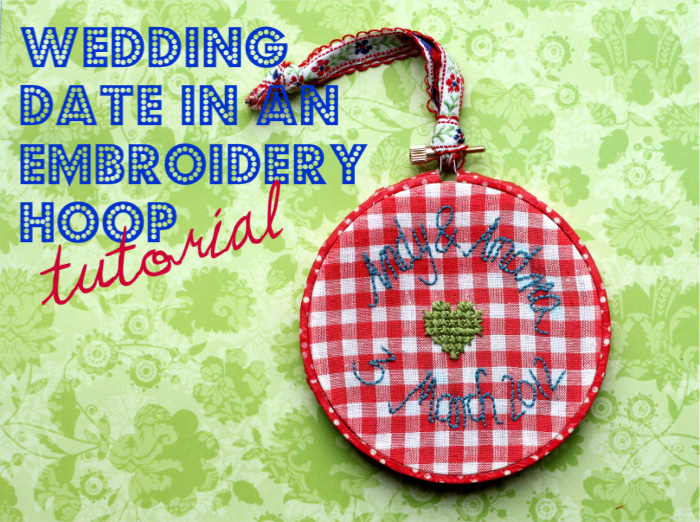 love the idea of covering the hoop in washi tape! I love it! 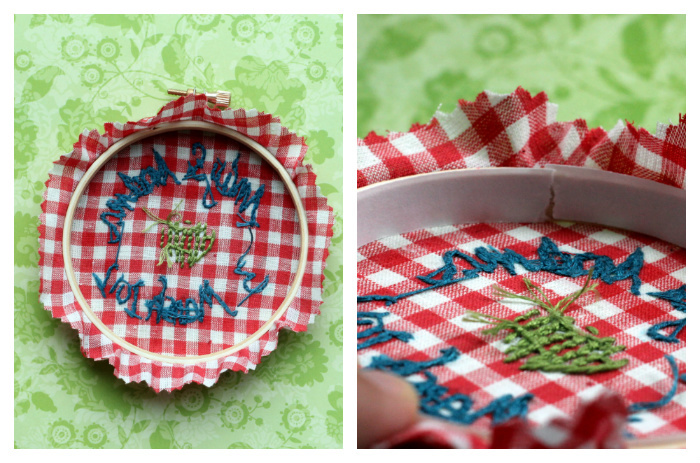 What a great tutorial, such a cute little memento and a quick little project. 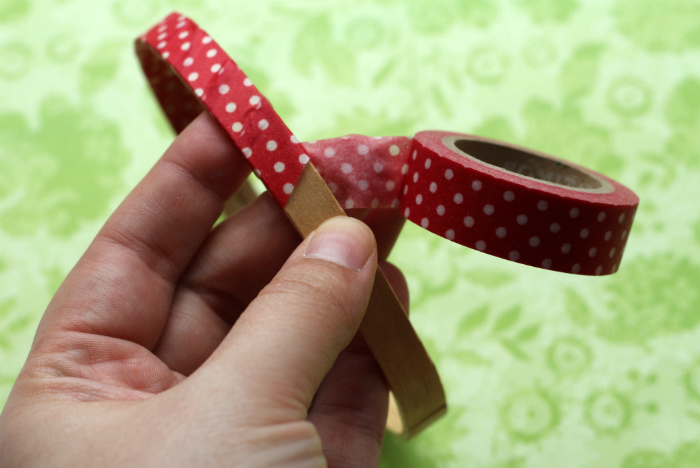 I definitely need me some washi tape! Goodness - how lovely! They must have been so chuffed by your gift! you are just the sweetest Annika!